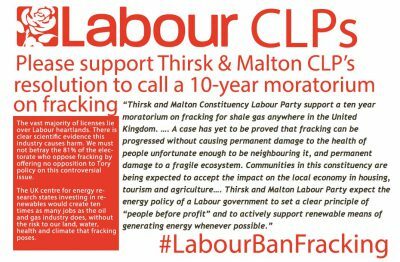 The good news is we can bring that policy closer to a reality thanks to a resolution drafted by Thirsk and Malton CLP asking for a ten-year-moratorium on fracking, which is accompanied by a fringe meeting with Shadow Secretary of State for the Environment, Rachel Maskell MP, to be held at 6:30pm on Monday 26th September at Suite 9, Jury’s Inn, Keel Wharfe L3 4FN. For Thirsk and Malton’s resolution to make it to the conference floor it must win the support of CLPs across the country, so please tweet the resolution below at your local Constituency Labour Party. A link to our tweet, aimed at all the Greater Manchester Boroughs currently threatened by fracking is HERE. We’ve also written a template letter for you to send to your Labour MPs, MEPS and Councillors asking them to support Jeremy Corbyn’s policy and Thirsk and Malton CLP’s resolution. You can use this handy service to find their addresses. 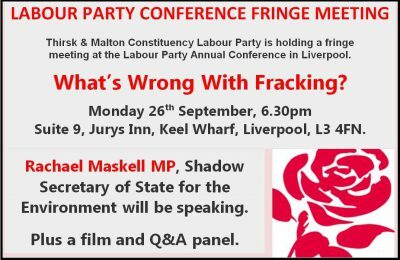 And please feel free to make liberal use of the #LabourBanFracking when the party’s autumn conference kicks off on Sunday 25th September… and especially at 6:30pm on Monday 26th when Rachel Maskell’s fringe meeting is taking place. And why not keep on using it until conference ends on Wednesday 28th September or when #LabourBanFracking (whichever happens first)? I am writing to seek your views on whether you will be supporting Jeremy Corbyn’s policy of banning fracking, phasing out coal by 2020 and pushing for major national investment bank funding in renewables in order to meet our Paris Climate Commitments of keeping global warming to 1.5 degrees above pre-industrial levels. Labour constituencies are bearing the brunt of areas licensed for fracking, a means of energy extraction opposed by 81% of the electorate (according to a recent DECC poll), so it is imperative Labour offers the electorate opposition to Conservative Party policy on this very controversial issue. The realities of the dangers of fracking came home to roost in Oklahoma recently when a 5.6 Richter scale earthquake hit during well injection of fracking waste. Four USA states have openly declared water contamination from fracking. The Committee on Climate Change have advised fracking for gas is not compatible with our climate commitments and there is no adequate regulation to deal with the rogue methane emissions that make fracking 20% more warming in the atmosphere than coal over a 20-year period, according to a study by Cornell University. The next twenty years are a critical time for our planet, when we should be cutting our emissions, not adding to them. Parliament’s own Environmental Audit Committee advised that fracking isn’t compatible with our climate commitments, and presents a significant localised public health risk – and peer reviewed studies support this view showing increased cases of respiratory diseases, cancer and birth defects in communities affected by fracking. Jeremy Corbyn’s policy and Thirsk and Malton CLP’s resolution doesn’t just present an opportunity to reflect popular opinion: it is a chance to tackle climate change and help lift people out of fuel poverty by protecting citizens from the rising energy costs built into the Hinkley Point C deal. It gives us the opportunity to invest in a democratic, user-friendly energy system in rooftop and community owned solar, wind and hydro that will build ten times as many jobs as fossil fuels do (according to the UK Energy Research Centre) and without the risks to our children’s future. I hope we can start to build that green future with the full support of the Labour Party instead of gambling it on the continued use of fossil fuels. Good Luck with getting your resolution on fracking discussed at Conference! I’ve passed it to my local CLP Maldon, Essex and hope they will support it.